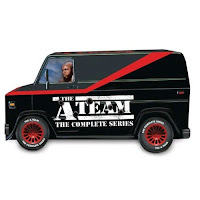 So were you a fan of "The A-Team"? I'll confess, it seemed like a boy show to me as a kid, so I never watched it in the 1980s. But like everyone else in the world, I was unable to ignore Mr. T. His Mohawk, his gold chains, his giant muscles, his "I pity da fool" catchphrase. He was one of those stars who soared well above their show in fame. According to Wikipedia, he started wearing all the gold when he was a nightclub bouncer, as he would don the chains and necklaces club patrons left behind, thinking if they came back, they'd recognize and claim their jewelry. 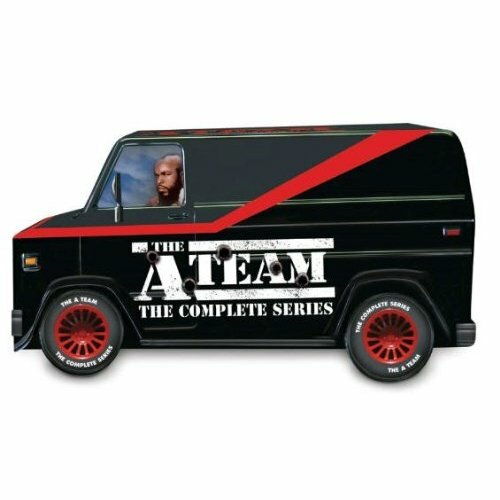 If you were a fan of the old-school A-Team, you should know that the complete series is now on DVD, and it comes in a Mr. T driven van box! These seriously have to be among the best opening credits of the 1980s.